Swing batter batter batter, SWING! First base, then second, then third, SHE IS GOING FOR HOME! It is a homerun! Softball can be a very exciting game but it is also very statistical, when it comes to keeping up with the score that is where we come in. Our most basic scoreboard keeps up with the score, strikes and outs and innings. We can be as basic or complex as you need. Add in inning by inning hits; hits and errors; totals hits, runs or errors and number at bat. We also offer pitch count for home and guest, which has become increasingly popular with the change in rules for some states. Customize your board with your team or league logo, sponsor panels or decorative arches. The 3311 has all the features of the 3314, with the addition of a game clock and space for an optional logo. Featuring all of the basic game function of the 3311, the 3312 trades logo space for a larger clock that an count down from 99:59 maximum. Featuring all of the basic game function of the 3312, the 3312PC trades the clock for a fully-capable pitch count! 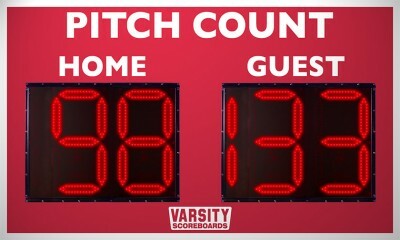 8' x 6' x 8"
Featuring the game function and clock of the 3312, the 3355 adds built-in Home and Guest pitch count. 9' x 6' x 8"
The 3388 builds on the game functions of our other baseball scoreboards, but in a stunning, 16-foot wide cabinet. 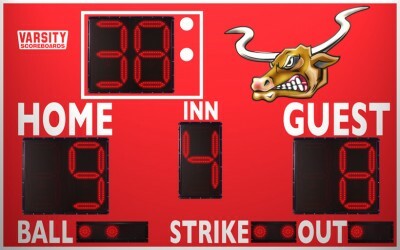 The PERFECT scoreboard for smaller youth baseball/softball leagues that only need to score up to 7 innings. 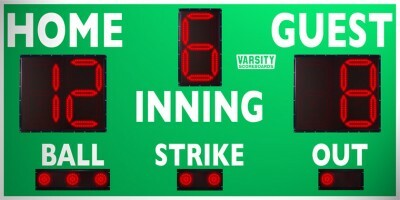 15' x 6'6" x 8"
The 3320 updates the classic baseball/softball scoreboard layout with 15" super-bright 100,000 hour LED displays for maximum visibility. 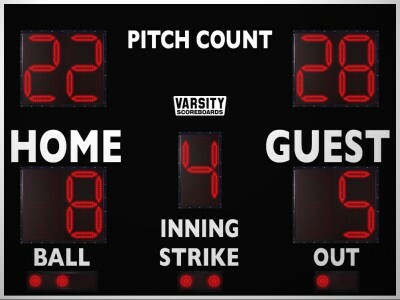 Full-featured 9-inning baseball/softball scoreboard with vital game information and built-in pitch count! 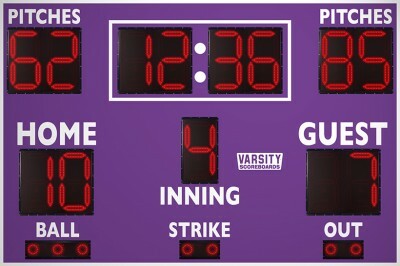 Full-featured 10-inning baseball/softball scoreboard with vital game information in a remarkably compact 20-foot-wide package! 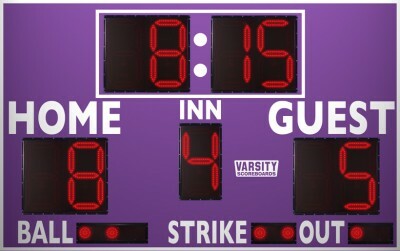 20' x 6'6" x 8"
Our largest baseball/softball scoreboard incorporates inning-by-inning scoring, At Bat, Ball, Strike, Out and Hit/Error displays as well as Total Runs, Hits and Errors. 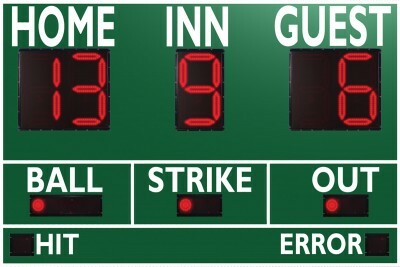 Virtually identical to the best-selling 3328, but instead of AT BAT and H/E displays, features three-digit pitch count! 5' x 27" x 8"